It already reveals the maint thrust of the book, having to do with practices of contemporary digital art and theoretical insights into embodiment – for instance the concept of the implicit body. Nathaniel Stern’s book is a marvellous introduction to the thinking and practice of this innovative new media artist, and to the work of others in the same field. Philosophically informed and beautifully written, it is sensitive to the many complex issues involved in making such work. –Charlie Gere is Professor of Media Theory and History in the Lancaster Institute for Contemporary Arts, Lancaster University, and author of Digital Culture, Art, Time and Technology, and Community without Community in Digital Culture. 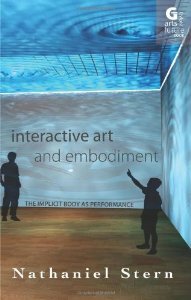 In Nathaniel Stern’s Interactive Art and Embodiment, Stern develops a provocative and engaging study of how we might take interactive art beyond the question of ‘what technology can do’ to ask how the implicit body of performance is felt-thought through artistic process. What results is an important investigation of art as event (as opposed to art as object) that incites us to make transversal linkages between art and philosophy, inquiring into how practice itself is capable of generating fields of action, affect and occurrence that produce new bodies in motion. –Professor Erin Manning, Concordia Research Chair, Faculty of Fine Arts, Concordia University, author of Relationscapes: Movement, Art, Philosophy, Director of the SenseLab and series co-editor of Technologies of Lived Abstraction. In his very intelligent book, Nathaniel Stern shows how dynamics work: he mobilizes a range of theory and practice approaches so as to entangle them into an investigation of interactive art. Stern maps the incipient activity and force of contemporary art practices in a way that importantly reminds us that digital culture is far from immaterial. Interactive Art and Embodiment creates situations for thought as action. –Dr Jussi Parikka, media theorist, Winchester School of Art, author of Insect Media.